For the first time, Afghan men and women who have tirelessly promoted women’s leadership in government and private sector will be recognized. This will be done through the Champion Awards, which will be launched on July 15, 2018. The Champion Awards is a long-term plan to identify and recognize women empowerment supporters, and in so doing, accelerate societal and institutional acceptance and support for women’s active participation in society. An ‘ideal’ champion is a man or woman who has demonstrated significant leadership in promoting and advancing the role of women in the public sector and the society at large. The initiative is spearheaded by the Ministry of Women Affairs (MoWA), and supported by the Ministry of Labor, Social Affairs, Martyrs and Disabled (MoLSAMD), selected civil society organizations, and other governmental and non-governmental organizations including youth groups, and academia. Who may apply for Champion Awards? There are two categories of the Champion for Women in Government Awards: Government Sector Awards and Private Sector Awards. Below are the criteria for each category. What will the Champion receive? Recognition and an award: An award ceremony will be held in Kabul and will be attended by dignitaries from the government and international organizations. 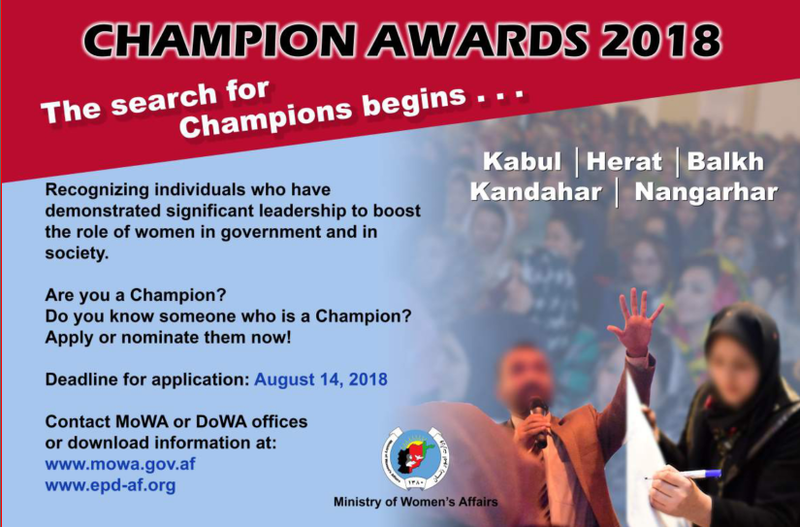 The main outcome of this award is to recognize the Champions for the work they have done supporting women in Afghanistan, as well as promote support of women leaders through social media and traditional media. Direct Application: An individual can apply directly for the Champion for Women in Government Awards. Referral Nomination: An individual may be nominated by another person such as the director of an organization where he/she is currently working or has worked in the past or his/her immediate supervisor. 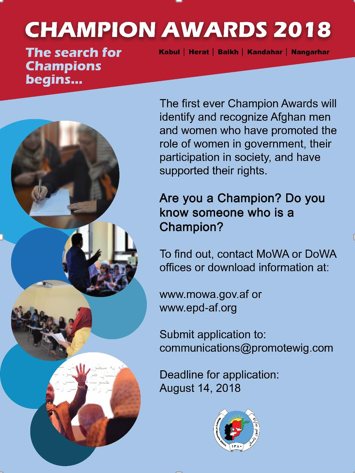 Those who meet the criteria and live and work in Kabul, Herat, Balkh, Kandahar, and Nangarhar are invited to apply by sending their applications via e-mail to: communications@promotewig.com. A confirmation email will be sent once application is received.